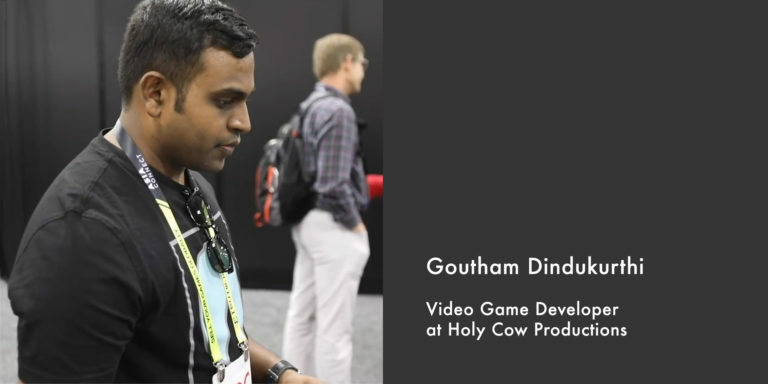 Our main man behind the coding team for Bot Rods, Goutham Dindukurthi of Holy Cow Productions, just returned from his time at the GDC, San Francisco, demoing Bot Rods at the Microsoft ID@Xbox kiosk in the IGF Pavilion. and get a debriefing done. Why did you wish to be a part of the Game Developers Conference this year? GDC is by far the biggest conference for game developers and Bot Rods being at this stage in development, I thought, could not have a better time to be showcased! Not to forget all the great feedback on prior GDC events from other inspiring developers kept us highly motivated. We were lucky enough to get a space at the Microsoft ID@Xbox kiosk in the IGF Pavilion. Can you share your experience from the GDC that was held last month in San Francisco? I had an amazing experience at the GDC and I would like to take the opportunity to thank the people who made it happen – Blake Merriam from Game Designers Network India, ID@Xbox Team and the ETC @ CMU. Being able to demo the game at the IGF Pavilion, and at the Entertainment Technology Center’s booth space was phenomenal, to say the least. We were demoing at the IGF Pavilion between 2 pm and 4 pm on the first day of the expo and it was very exciting to see the pavilion had so many visitors! We got a lot of gamers, developers, and friends to check out the latest build and collected valuable feedback. How was your participation in the GDC this time beneficial for you and for your game, Bot Rods? Taking part in the GDC was mostly useful for the feedback and hopefully making Bot Rods known to a few more people. The most memorable moment was when we had people recognize the game and the progress from our previous showcase at Microsoft Pre-PAX 2018 event. It felt like there was a quite a bit of validation for us in terms of the gameplay and art since a lot of the people who played Bot Rods loved it and are looking forward to its release. Can you tell us something about the other exciting games you have played or any workshops you may have attended in the event? GDC is an event where you see almost every game and upcoming game! I did get a chance to play a few but the ALT CTRL GDC was the most interesting! A bunch of innovative projects using alternative controls for gameplay was an amazing experience.